Why Monitor the Java Virtual Machine? The Java Virtual Machine (JVM) forms the core of the Java application architecture. 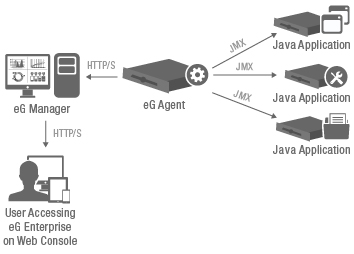 It plays a crucial role of interpreting and translating the Java byte code into operations on the host platform. 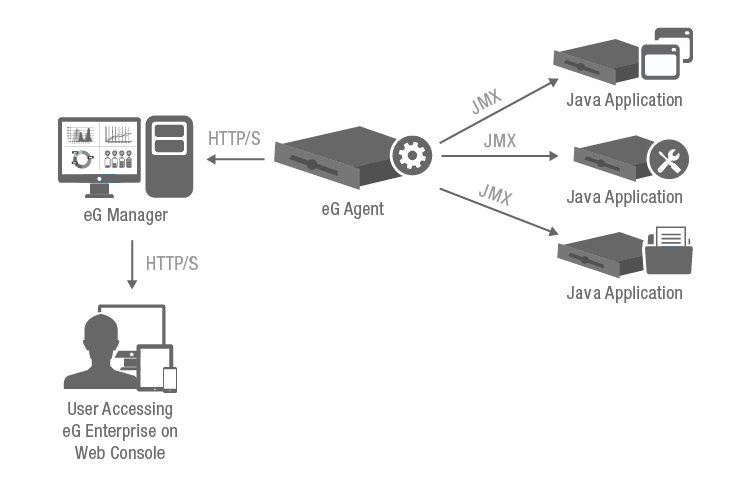 Because the Java middleware—including application servers such as Tomcat, JBoss EAP, WildFly, Glassfish, WebSphere and WebLogic—runs on the JVM, a performance issue at the JVM level has a significant impact on business services supported by it. Monitoring of the JVM must be an integral part of any Java application performance monitoring strategy. IT Ops and DevOps teams use JVM performance metrics to troubleshoot server-side bottlenecks. Developers and architects can also benefit from JVM monitoring by uncovering code-level issues. 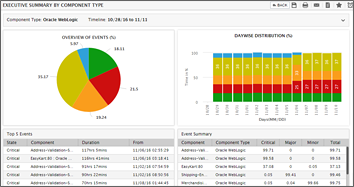 eG Enterprise is a state-of-the-art Java performance monitoring solution that goes deep into analyzing issues across all Java tiers—from user experience, web front-end, application server, JVM, all the way to backend database and storage. Using JMX, eG Enterprise monitors JVMs in depth, tracking key performance indicators of all aspects of a JVM’s performance. Unlike other JVM monitoring tools, from a single, easy-to-use web console, administrators and developers can analyze JVM performance, correlate it with other infrastructure metrics (server, virtualization, storage, etc. ), and see actionable insights in the form of proactive alerts and intuitive dashboards for rapid problem diagnosis. Java applications can fail or slow down if the memory available in the JVM is insufficient to handle the workload. eG Enterprise tracks usage levels of the JVM’s heap and non-heap memory and proactively alerts if memory usage levels are high. Analysis of each of the memory pools including Eden space, Survivor space, Tenured gen and Perm gen space highlights how the JVM’s memory pool settings can be right-sized for improved performance. 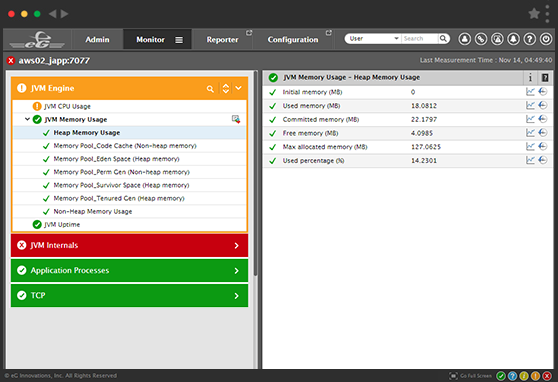 Memory monitoring at the JVM level also highlights any out-of-memory exceptions and potential memory leaks. In the latter case, top object types consuming memory are highlighted, making it easier for Java developers to fix memory leaks. Proactively identify situations when thread leaks are occurring in the JVM and could ultimately result in the Java application slowing down or failing. Receive automatic alerts for situations where one or a few threads are taking up excessive CPU resources, potentially slowing down all processing by the JVM. In a single click, drill down to the exact method/line of code that is causing the CPU spike. Identify thread blocking and deadlocks: Easily see the stack trace of a blocked thread and its blocking thread to find out why there is blocking or a deadlock condition. eG Enterprise allows you to easily track all garbage collection activity in the JVM: Identify when garbage collection happened, how often it is happening, how much memory is being collected each time and how long the garbage collection activity is running for. Is there any runaway thread hogging the CPU? Which line of code is it executing, in which class, and which method? Is the JVM heap and non-heap memory sized correctly? Are there any out-of-memory-exceptions or memory leaks? When does garbage collection happen, and how much memory is freed up each time? Are there any thread deadlocks causing application processing to hang?